We looked for a place for Lili to ride and found a stable in Molfetta, the next town over. The owners are the Minervini family and boy do they have an interesting story! The father Greorio lived in the States for ten years, and is famous for riding a horse, solo, for ninetynine consecutive days from the Mexican border to Washington state. (He said the Sonoma desert part was 'very difficult' - I can only imagine). His story has been written into a book, and it may be made into a movie as well! The stable only does Western style riding, and we learned about completely new things to do with a horse such as reining and cutting. Gregoriano's daughter Caterina was the teacher at Lili's lesson. She is wearing the 'Italia' cap in the photo above. Today was Lili's last riding lesson in Finland. We have had a great time at Alaspään Ratsastuskeskus in Hämeenlinna, whose owner Terhi has been very gracious in fitting Lili into their classes. Here are some images. Lili on Eetu, a beautiful 23 yo gelding from Estonia. Lili at first jumping class (in white pants in the front). Lili and Miku. Miku was the first horse Lili jumped with in Finland. Miku is a strong character and also taught Lili something completely new: how it feels to fall off a horse! Emmi was coaching Lili at the indoor class. Lili on Guni on what ended up being a private jumping class. Jump! Jump! Coach Siiri in the front, and Lili leading Guni out after the class. Thank you for everything Terhi! Until we meet again! We visited the photographic museum in Stockholm. It is a great place to see both classic and contemporary photography. Lili really enjoyed an exhibit of horses in photography and we also saw three horse films related to it. One was about a Swedish show jumper Peter Fredriksson and his horse All In. The film showed his training of the horse. The film was made before the Rio Olympics wher he went on to win the show jumping silver! Some of the amazing horse photos we saw. The bottom one is of a horse diving into water off a 20 meter platform. Yikes! There was also an exhibit of photos by the iconic Irving Penn. What a feast for the eyes! We went to the Louvre! Wow it is always a humbling experience, and frankly I have been putting it off in fear of big lineups. Last night we went for a stroll, and the museum was open till 9:30 pm which I did not know so it was a real lucky strike. No lineups at all, we walked in, got tickets, and went to say hello to La Gioconda, otherwise also known as Mona Lisa. Dante wanted a picture in front of this enormous painting. It is 'Les Noces de Cana' by Veronese (Paolo Caliari), from 1563. Love this. It is in one of the main stairwells. It is The Winged Victory of Samothrace, also called the Nike of Samothrace. Remember this? 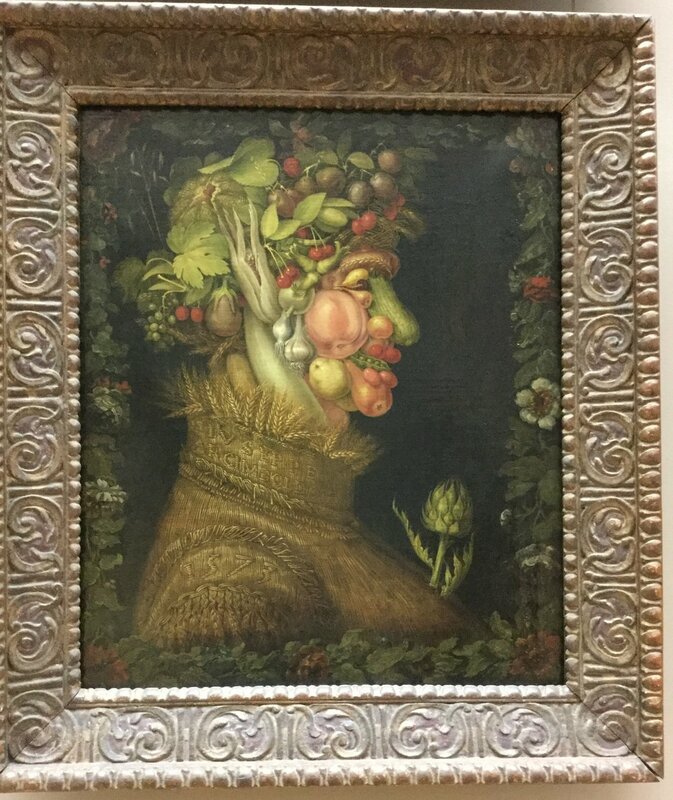 We have a picture book of the vegetable guys of Giuseppe Arcimboldo, appr. 1573. He made four of them, one for each season. This is summer. This very cool bowl with all kinds of animals was in the new Islamic Art collection. It is from Iran! ...and Lili of course loved anything with horses. These marble ladies are from Greece, about 2700 - 2300 BC. Amazing! Their poise and comportment make me think of yoga people. Outside in the evening sun. Out of all the things we have done in Andalucia, we will probably remember our time at Caballos y Vino the most. This is the home ranch of Sandra and Luis where Lili took her riding lessons - eight in all, consisting of six lessons and two long trail rides. 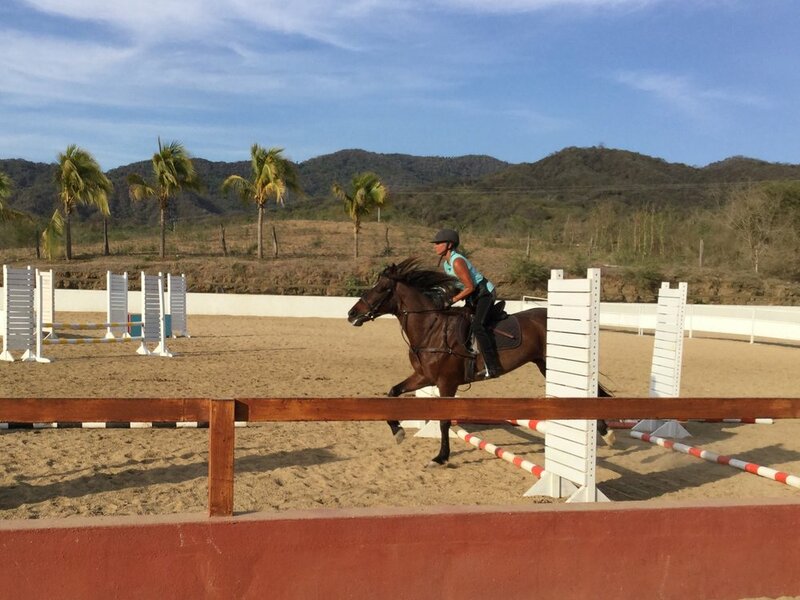 At the end of our month in Spain, Lili was able to freely canter on her own, ride a barrel race course at trot and canter and do several horse care chores all by herself. Her posture, confidence and joy of riding were all increased by leaps and bounds. And it was lovely for Sandra to have a student for a longer stretch as she often gets clients who only visit once or maybe twice. A happy girl cantering with Spirit. The trail ride on the last evening, first setting out with clients Ben and Alex from New York, and then coming back in the low evening sun. We have also got to know Sandra's parents Alfred and Barbara who are visiting from Germany and for our last evening we had a dinner together. They are such lovely people. Alfred would normally putter around the ranch with handyman work such as fixing a car, regrouting the masonry, preparing the outdoor pool for the summer season or power washing the patio. Barbara and I would sit, chat and do handwork - I picked up crocheting and have made many little coasters and cotton flowers, some with beads. Sandra's sister Manuela is coming to visit in a couple of weeks with her little son Max who is four. Alfred made a swing for his grandson, and Dante is testing it. All worked great! Here Alfred is showing his carving skills. 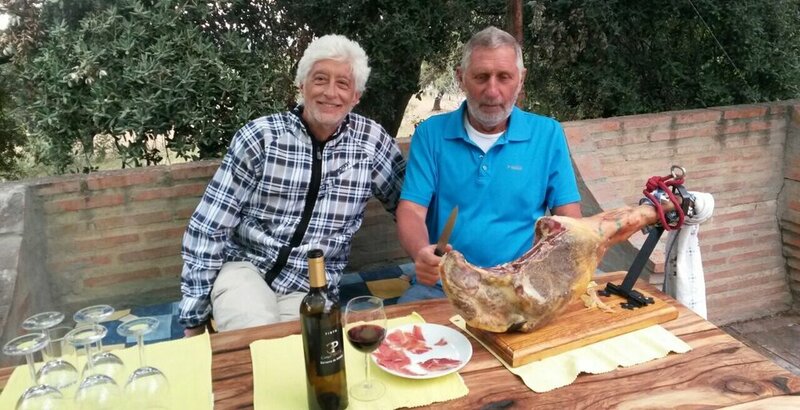 Sandra won this ham at a local Horsemanship competition at a Romeria gathering. Note the special ham holder apparatus! Here is our outdoor dinner after Lili's ride. Dante made pasta with Gorgonzola and we also had a lentil stew and broccoli with garlic and balsamico. Sandra whipped up sautéed sprouted lentils (in the frying pan) and they were so good. We will definitely add that to our lentil repertory. The food was gone in a whiff and then it was time for our goodbyes. And what a lovely gift Lili received from Sandra at the end of the evening - she gave Lili the small riding boots that we were able to borrow on the day we forgot to bring her cowboy boots. When we got home Lili washed the new boots for about half an hour in the shower and wore them at home all morning. Thank you so much! We hold so many happy memories of Sandra and her horses. Our hearts are full. Until we we meet again! Remember Galleta, the lovely mare Lili was riding in early March? We just got an email from Jehu with pictures of her newborn foal - so lovely. Here is one more huge gift we received from volunteering at Sayulitanimals: we got to know a really great place where to ride horses - at Vista Paraiso with Pablo Braunschweig. People drive here all the way from Puerto Vallarta to take lessons. It is a gorgeous riding school with many lovely horses, and a proper jumping ring. Karen rides here, and took us with her one day to see the place. It looks like we may end up having time for six lessons before we move on next week. Wow... I like it here. Here Lili is practicing in the kids ring with Snowball. She is learning to keep her hands lower - check other photos for progress. Lili likes this picture. The helmet was a bit too big and it was falling on her face, but Lili thinks it gives a certain solidity, a 'military look'. This was also the first time Lili was riding with a crop. Here is Lili with Planet. Learning to care for the gear. Showering Planet. It was a hot morning so I think both rider and horse were a bit sweaty. Karen doing a beautiful jump. This is one of the 'big girls'. Unfortunately I do not know her name. And here goes Stephanie on Apollo. She has been such a kind and supportive teacher for Lili. In these pictures we are capturing some of our last days in Mismaloya. We had a great month there with lots of sun, pool and beach time, great home cooked meals (our suite had a good kitchen), and lots of new friends. But first and foremost Mismaloya was about riding horses. Horses horses horses! Lili rode almost every day, and by the end of the month she was galloping at good speed coming home from the rides. She never gets tired of riding. Lili and Dante having a terrible time at the pool. ..
Lili and friend Kaylee from Oregon made little flower rafts for the pool. Kaylee was born in Ethiopia! This is Jehu with Lili after one of the rides. This horse is Chilindrina - and she is also pregnant. Other horses that Lili rode were Galleta, and Lucero. Chava normally rode Mariposa and Jehu rode Cuervo or sometimes Scorpion. There was also Coqueta (that had the colt) and Susana (John from Texas rode Susana). Lili on Galleta. Galleta was excused from riding duty about a week before we left because her baby was due soon. We have asked Jehu to email us a picture of the foal when it comes. Lili on a ride with the lovely Waterman family from California. From the front: Cuervo's back - Jehu took the picture. Then Cosette on Chilindrina, Lili on Galleta, Amy on Susanna and Jeff on Scorpion! And yes. We have carried those cowboy boots all around the world, through all the countries we have visited so that Lili could use them when she rides in Mexico. But it sure is super cute and we had a lovely time visiting it this morning. Horses carry their babies for eleven months, that is even longer than people. I never knew that. And when the foal is born, it learns to stand up in about an hour, and normally they can run in a few hours. I guess these were all indispensable qualities for wild horses on the go. Lili also taught me some terminology: the baby horse is a foal - a male foal is a colt - and when it gets to one year old it is called a yearling. Guess who was excited to see the baby? Dante, Linda and the black hen also had a visitation. And then a little snooze. Here we are in Mexico and one of the first things we did was go to see if the horses were still there and if Chava was still there to take people out riding. And the answer was yes to both! Our horse from last time (Mickey Mouse) has been sold, but there are lovely new horses for us to get to know. Lili has taken riding on three days already - this is where the money from selling all those postcards is going. Second day. Lili, Chava and Galleta. hire in evergreen there are 9 horses named Flicka, Amber, honey, and chicku those are the 4 pony's .And opaline, kal-el, Kayla, Santiago, And Moksha the 5 horses.And there owners Sara and Matia hire are the horses my favorite is amber she is a small pony this is her bilou.